Fall is finally upon us, bringing colder temperatures and the holiday season. Fall also brings beautiful scenery—the rainbow of colors seen as leaves begin to transform and fall from their branches. 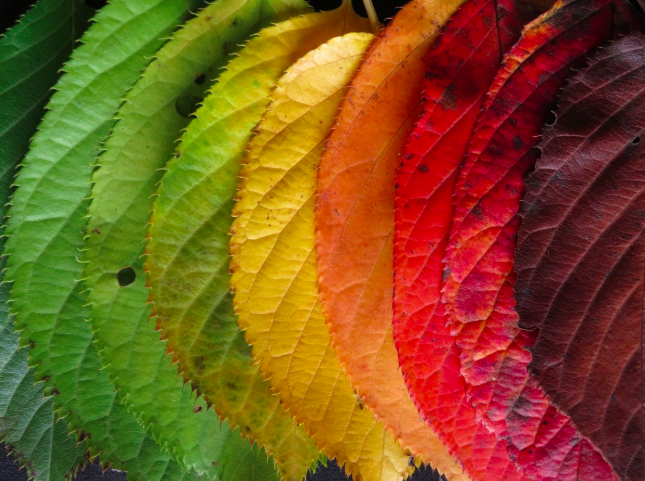 Not surprisingly, this phenomenon—and the reasoning behind why only some leaves change color—is easily described by cool, natural science! You may have already learned about why leaves change color; words like “chlorophyll” and “carotene” may be familiar. Simply put, “chlorophyll” is a chemical that helps leaf cells undergo photosynthesis, a method to generate their own carbohydrates and energy from light. 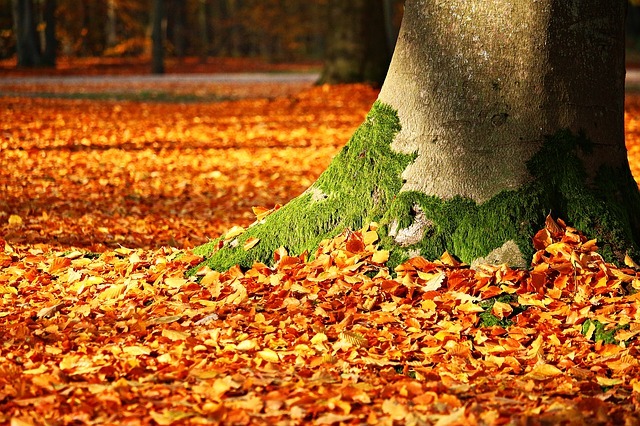 Chlorophyll is also what gives leaves their green color, while masking the yellows, oranges, and reds beneath. In the fall, as the days (and hours of sunlight) get shorter and temperatures get colder, cells can’t complete photosynthesis as well, and chlorophyll begins to break down. Without the green pigment of chlorophyll, other colored pigments of the leaves are exposed. These pigments vary from plant to plant, which explains why different plants and trees have different colored leaves! But why do only some leaves change color? Even in the dead of winter with snow on the ground, some trees like pines or spruces still have their needles. Why the difference? 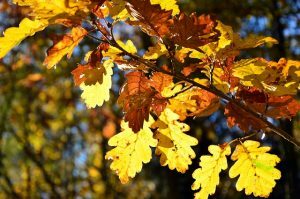 This answer lies in the fact that there are two types of trees: deciduous (those that lose their leaves) and coniferous (those that don’t) – it’s really that simple! Deciduous trees have classically broad, veined leaves – think of an oak or a maple tree. Having broad leaves gives a tree an extremely large surface area, which helps in generating as much energy as possible by absorbing sunlight. This is extremely useful in the spring and summer, when the tree needs to grow, but having a lot of leaves means that each leaf needs enough water to stay alive. During the fall and winter months, this becomes harder and harder to maintain, since a deciduous tree isn’t generating as much energy or receiving as much water as it was during warmer months. Thus, in order to conserve as much energy and water as possible for surviving the winter, these trees will drop all of their dying leaves. 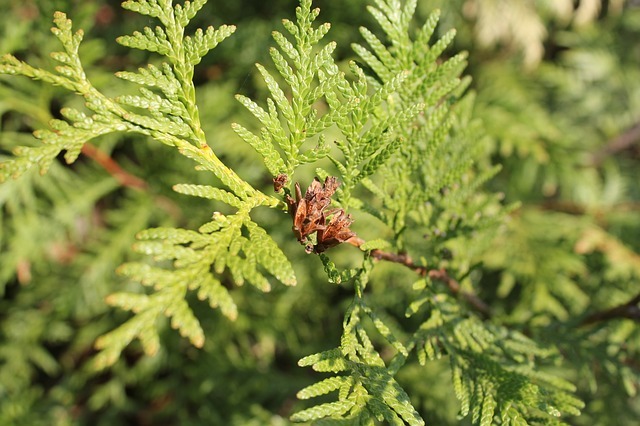 Coniferous trees (or “conifers”), on the other hand, have many small, thin, needle-like leaves. These needles each require less water and have a waxy surface that helps them retain water even during cold months (without this protection, water can easily freeze within leaves or branches, causing them to die!). Thus, conifers don’t need to drop their leaves to conserve energy, which is why the needles stay connected to the tree, alive, and green with chlorophyll! Fall doesn’t only bring the death of (some) plants, though! 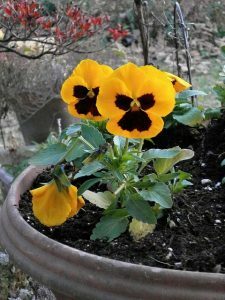 Certain plants and flowers, such as pansies, actually bloom specifically during the fall and winter months, particularly in warmer climates like our own native North Carolina! Ultimately, this is based on temperature—plants that can bloom even during winter down south may die in a colder climate. Plants that can survive cooler temperatures have evolved various methods for protecting themselves. Some of these survival techniques include hard, protective bark, deep and widely-spread roots, and ways of losing or protecting leaves. Other plants may protect themselves by having deep “bulbs” beneath the soil where they store their energy. They may also limit how tall and wide they grow, to save as much energy as possible! Fall in the South gives us a great opportunity to see many different aspects of plant science in action: leaves changing to a variety of colors, the intermixing of deciduous and coniferous trees, and flowers that bloom for nearly all of winter! It’s easy to take these scenes for granted or to merely appreciate them for how simple and beautiful they may seem. But ultimately, at the “root” of each phenomenon is a survival strategy, crafted over time (maybe even thousands of years!) to give us the great natural diversity we see today.